We’ve just started work on the 25 cents(10,000 sqft) of land around our house. This area is very close to the road which is at a much higher level. Also, till a couple of years ago, when there was no check dam, the stream across the road used to cut into this portion of the land. So with zero top soil and no tilling tools, we are looking at working only on 150-200 sq ft per day if we do it ourselves. May be we’ll hire some help. The idea is to convert this area into a food growing place that can nourish ~10 people. Unobstructed sun light will be needed(with some exceptions) so trees have been planted only along the boundary of this quartr acre. So far we have Tender coconut, Papaya, Moringa, lemon, Custard Apple, Curry leaves and flowering trees taking root. Also a permanent trellis structure has been created with left over stones from the fencing project for growing gourds, our favorite family of vegetables. 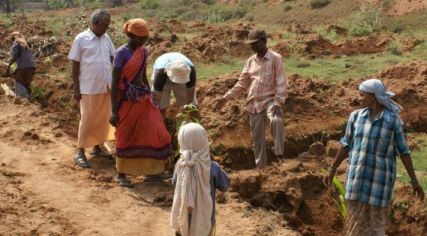 The task at hand is to divide land into smaller chunks, create these raised beds, arrange for irrigation, grow pioneer crops and then slowly switch to a mix of grains, pulses, veggies, oil seeds and spices on a rotational basis. We had done 3 raised beds and good friends from Goa helped us get to #5. The cool weather this week is definitely helping. Will post updates as the soil gets stirred and beds get populated.